According to my friend Ilona Abramova, a team of researchers at Reviews.com have dedicated over a thousand hours analyzing 2,223 formulas on the market to find the top 13 picks that offer optimal nutrition for our furry friends. Their in-depth guide to dog food can help dog parents choose safer nutritional options. Marketing companies use operative words like “All Natural”, “Healthy”, “Organic” and “Fresh” are at the very least misleading and in most cases, just not true. Beautiful packaging, pictures of wolves and adorable puppies, brightly colored kibble and “pull at your heartstrings” slogans, are all created for the benefit of selling food for dogs, to their human families. In early 2015, the law firm of Morgan and Morgan filed a class action law suit against Purina over ingredients found in its line of Beneful Dog Food. Despite this lawsuit-and the thousands of complaints of kidney failure that let to it-the product remains available to purchase at a store near you. The Truth About Recalls and Manufacturing Practices. 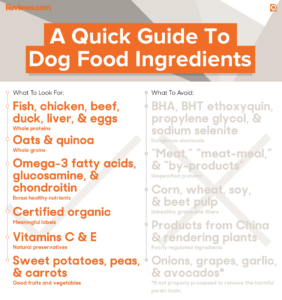 Good Ingredients and How They Relate to Your Dog. And my favorite — Dog Foods That Were Cut Because of Their Ingredients—and the reasons why. Thank you Ilona, for sharing this with us.